Recently, I sent StubbyDog a picture of me in my nurse’s scrubs wearing my StubbyDog “My pit bull is turning stereotypes upside down” shirt, and they invited me to share my story. I believe the simple joy of displaying your passion for pit bulls on a T-shirt, hat or pin affords one the opportunity to advocate on behalf of our favorite dogs! As a nurse at a children’s hospital, being a caregiver is a priority, but being a positive role model and teacher is also essential. When you develop a close bond with patients, they tend to look up to you and trust your opinion. I’m very fortunate to have this window of opportunity and to interact with such a large number of people. With such erroneous information in the media regarding pit bulls and pit bull mixes, I’m motivated to put out positive and accurate information whenever possible. 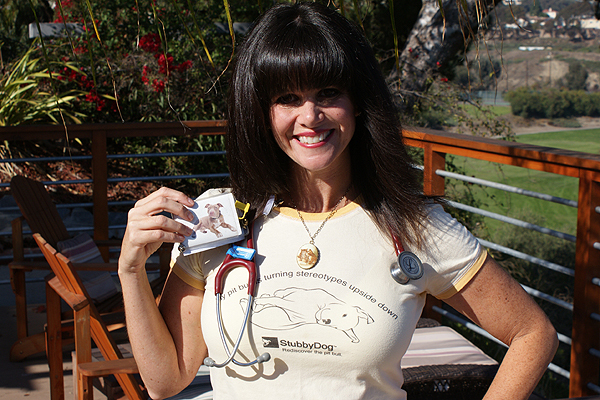 I choose to use T-shirts and pictures on my badge as well as in my office as a vehicle to teach my patients and associates the truth about pit bulls. I also volunteer for Pinups for Pitbulls, a nonprofit organization that helps canine victims of neglect and cruelty, and raises awareness about breed-discriminatory legislation (BDL) while helping restore the once stellar image of the American Pit Bull Terrier. They have trained me and given me the tools to effectively advocate for pit bulls and pit bull mixes. 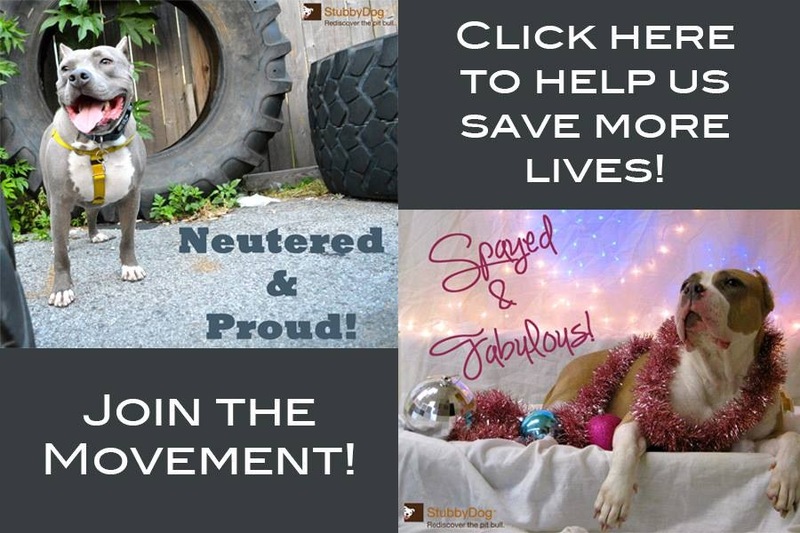 I have also used StubbyDog’s resources to make posters for pit bull events. Knowing what I have learned, I feel it’s not only my privilege but my duty to reiterate the message to the public. Working as an oncology nurse for more than 10 years lets me see a wide range of emotions, personalities and dynamics. It has prepared me to deal with difficult information and situations. I would bet that almost all responsible pit bull guardians have at one time or another had to defend their dog or explain their choice in dogs. Getting accurate information out there to what seems like a conditioned society not only helps the dogs, but it helps the public truly understand this iconic figure. Our pit bulls give us so much, and being able to give back to them what they give us tenfold is not only rewarding, it’s part of being a responsible pit bull guardian. As pit bull enthusiasts and lovers, we imagine a world where they will be seen as just dogs. Whether you volunteer your time, fundraise, display positive paraphernalia or just promote a positive image, you are making a difference! So display your pit bull pride! Support your local pit bull organizations and StubbyDog by buying some gear. You’ll look fabulous while you are helping to save lives. Life is richer when you have something to stand up for. 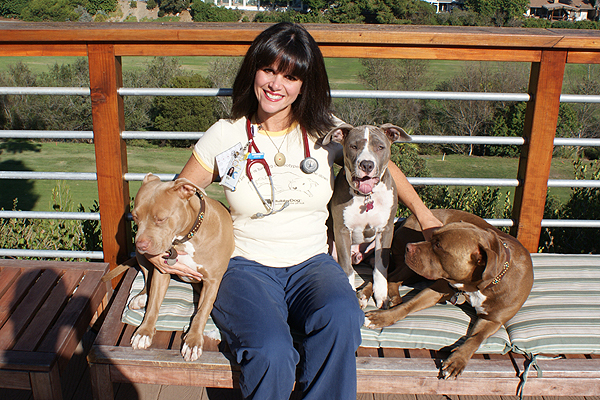 Editor’s note: If you have your 2012 Pinups for Pitbulls calendar, you’ll find Barbara and her dogs on the May page! We love our Miss May 2012! This is a great article! Thanks for including us. We love Barb & we love Stubby Dog! @LittleDarlinglittledarlingpbpinups4pitbulls And we love you too! Keep up the good work! Barbara’s story should remind all of us to use whatever opportunity is before us to “talk up” pit bulls. She does a fanstastic job advocating for the breed!